It's been a busy old week in camera land, what with Canon announcing its new professional flagship EOS 1DX camera and the continuing saga of Olympus sacking its CEO after just two weeks in the job. Elsewhere, Nikon and Sony have both been affected by the recent floods in Thailand, the world's first "shoot first, focus later" camera has been revealed and Google+ has had a staggering 3.4billion photos uploaded to it in the past 100 days. Not only that, but we've also launched our very own TechRadar Cameras Facebook page - I think we need a lie down now. Have a look at all the latest news, complete with links to the full story. 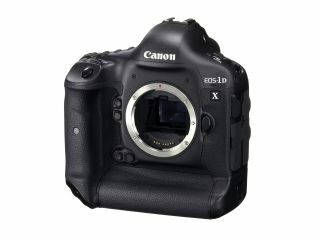 The world had been waiting with baited breath to see what Canon would unveil as the replacement for the 1Ds Mark III and the 1D Mark IV, and finally, this week, the Canon EOS 1DX was unveiled. Featuring an 18 million pixel full frame sensor, sensitivity ranging from ISO 100-51200 (expandable up to a crazy 204,800) and a new Digic 5 processor, you'll have to wait until March to get your hands on the £5,300 beast. If you're thinking of putting your pre-order in now, have a read of the first impressions of Angela Nicholson, our Head of Testing. One of the biggest stories this week has been the strange tale of Michael Woodford, ex Olympus CEO, who was ousted from his job after just two weeks. The Japanese camera giant claimed it was down to a "culture clash", but Woodford has suggested it was due to him trying to get to the bottom of excessive advisory fees paid to mysterious firms in the Cayman Islands. Stock in Olympus has taken a nosedive, falling by 42% on Tuesday, and major shareholders have demanded to know answers. Meanwhile Woodford has visited the Serious Fraud Office in London in a bid to launch official enquiries. Watch this space. Nikon's Thailand factory ceased operation on 6 October after devastating floods spread across the area. Nikon is yet to recover from the damages, its most recent statement saying that the factory was submerged under 2 metres of water. Other technology giants are in a similar position, with Sony officially delaying the launch of the NEX-7 compact system camera and A65 SLT camera due to factory problems. Nikon is also likely to be impacted by Sony's factory closure, as Sony makes sensors for Nikon. Earlier in the year, Panasonic confirmed that it would be splitting the GF line in two, creating a professional version of the popular compact system camera. This week, reports are suggesting that the new camera will be called the Panasonic Lumix GX1 - that X is proving a popular addition to many camera names these days it would seem. This week saw the release of a world first. Lytro announced it was working on a camera to capitalise on light field technology earlier in the year and this week we finally got to see them in the flesh. The cameras are capable of shooting "living pictures", which allow you to change the focus point after the image has been shot. We'll have to remember that when looking through our blurry pub pictures. Prices start from $399, but alas, the cameras won't be here before Christmas. And finally, to round off this week's news, we're pleased to announced two exciting launches from us. First of all, we've started our own Cameras Facebook page, please like us to keep up to date with all the latest camera news, reviews, photographic industry news and more - including cat pictures. Now we know you won't be able to resist that. Not only that, but we're also pleased to announce that the publisher of TechRadar, Future, is also launching a brand new photography magazine, N-Photo, (yes, printed on old fashioned paper) aimed specifically at Nikon users. Phew - and that's it for now, next week we'll be visiting Canon Pro Solutions where we'll be hoping to get our grubby mitts all over the new Canon 1DX. Watch this space for a hands on review.